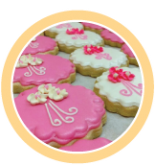 Custom designed sugar cookies are a Sweet Themes Bakery specialty, perfect for making any day special – birthdays, anniversaries, graduations, anniversaries, corporate events, grand openings and more. Note: custom cookies take time, so please allow a minimum 1 week (7 days for ordering), depending on availability on our calendar and quantity ordered. Sweet Themes Bakery is located in downtown Kent and provides cookies to the greater Seattle/Tacoma area. We can also package your order to take with you while you travel. Just be sure to ask when you place the order and we’ll let you know what your options are. Minimum order is 1 dozen cookies. Cookies are of the same size, shape, cookie flavor, icing flavor, color(s) and basic decorating design per dozen. WE DO NOT MAKE ASSORTMENT SETS i.e. 3 baby onesies, 3 baby bottles, 3 baby carriages & 3 baby rattles). Each additional decorating layer (such as personalized writing, air brushing, sanding sugar, luster dust, edible glitter) or other special technique (such as stenciling) is subject to additional charge. Depending on the requested cookie design/cookie shape, decorating prices may vary per dozen due to multiple colors changes and design complexity. STARTS at $4.00 each / $48 per dozen. STARTS at $4.50+ each / $54+ per dozen. Photo Edible Cookies (printed photo or logo) – Cost per dozen will depend on the size/shape of the cookies. STARTS at $4.00+ each / $48+ per dozen. Yes we are able to make photo edible images to put on cookies for an additional price. **PLEASE NOTE: Photographs or logos are printed images on edible sugar paper using edible ink from an ink jet printer. Images will be printed “AS IS” from the .jpeg file(s) provided by the customer. We do not have a library of graphics for customers to choose from. We are not graphic designers and do not have the computer programs/capability to change colors, writing fonts, objects, etc. on the provided .jpeg file. Colors may vary from the original picture(s) when printed from ink jet printer. Cookies are carefully placed together in a box to be presented at your discretion and are not stacked on top of each other. We can also individually wrap cookies with one matching Dyna-Satin ribbon, all the same color on each bag, for $12 per dozen or a sealed bag for $6 per dozen (no ribbon). Note: Please check your email inbox for an automated response confirming your cookie order form was received by us. If you did not receive a message from us than your order form did not go through for processing and it will need to be resubmitted. We will contact you to verify your order details and to make payment arrangements with you. Prices subject to change without notice.